Testing of specimens for the diagnosis of rabies virus in humans is performed by the Centers for Disease Control and Prevention (CDC). The WSLH Rabies Laboratory can assist with the shipment of human specimens to the CDC. Prior to submitting animal specimens to the WSLH for rabies testing, consult with your local health department, healthcare provider (in cases of exposure of humans to animals suspected of infection with rabies), and/or veterinarian (in cases of exposure of domestic animals to other animals suspected of infection with rabies). A listing of local health departments in Wisconsin is available at https://www.dhs.wisconsin.gov/lh-depts/counties/index.htm. Rabies testing is the only animal testing performed at the WSLH. If you submit a Wisconsin Veterinary Diagnostic Laboratory (WVDL) test request form along with the WSLH rabies requisition form, the Rabies Laboratory will forward tissues to WVDL for additional diagnostic testing of the animal. Euthanize all animals (including bats) humanely prior to submission to the laboratory, avoiding trauma to the head. Refrigerate the animal postmortem. Submit animals whole if they are squirrel-sized or smaller. Submit only the head if the animal is larger than a squirrel. Allow the head of the animal to exsanguinate prior to packaging to avoid leakage during transit. Note that the WSLH is no longer performing necropsy on large animal (bovine, equine) specimens. To expedite testing of these animals, it is recommended that you remove and submit only the brain for rabies testing. Large animal heads that are received at WSLH will be sent out for necropsy which will result in a delay in rabies testing. If you have questions regarding large animal brain removal, please call WSLH Customer Service at 800-862-1013. If you are submitting only the brain of an animal, be sure to remove and submit the entire brain. Reliable rabies diagnosis requires full cross-sections of the brainstem and cerebellum. 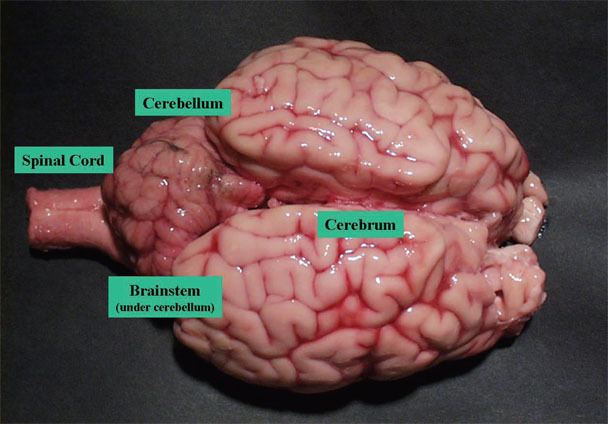 Cross-sections from both hippocampi may be substituted for cerebellum when the latter is unavailable. 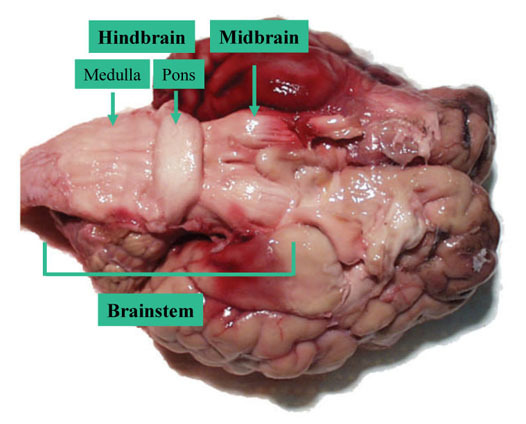 Dorsal (figure 1) and ventral (figure 2) views of gross brain anatomy are provided as a starting reference. Brain extraction should only be performed by veterinary staff who have completed a review of a neuro-anatomy reference or already have detailed knowledge of the gross anatomy of the brain. If any of the required tissues described above are missing, specimens will be reported as indeterminate, which may require exposed individuals to receive rabies post-exposure treatment. Damaged Specimens: Unless it is obvious that no brain tissue remains, we recommend that damaged animal heads be submitted for testing since identification of rabies in the required areas of the brain may still be possible. Decomposed Specimens: We recommend that specimens in the early stages of decomposition be submitted for testing, as rabies diagnosis may still be possible. Chemically Treated Specimens: Rabies testing cannot be performed on specimens that have been chemically treated, e.g., fixation of tissue in formalin; these specimens are unsatisfactory for testing. Specimens Exposed to Excessive Heat: Rabies testing cannot be performed on brain tissue that has been exposed to excessive heat; these specimens are unsatisfactory for testing.